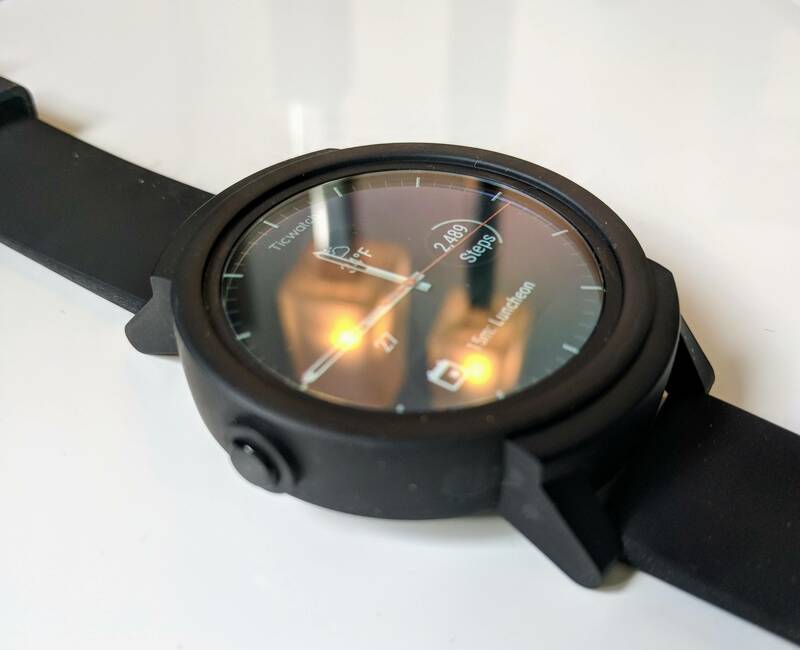 Without hesitation I recommend the Mobvoi Ticwatch E if you are looking for a solid performing Android Wear watch that won’t break the bank yet is current, powerful and well built. I’ve been wearing the watch nearly non-stop these past few weeks and I’m nothing short of impressed. The Mobvoi Ticwatch E comes in a decorated aluminum cube that is actually quite nice in itself. 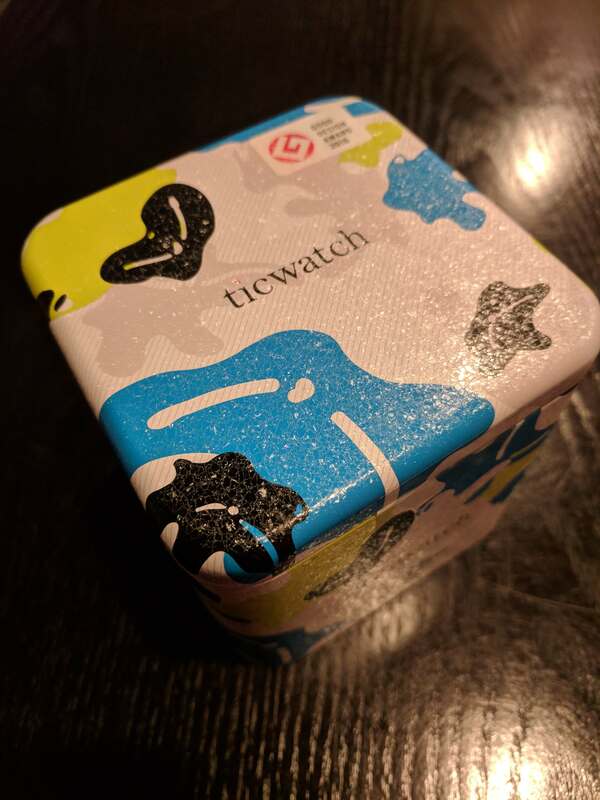 Once open, the Ticwatch E is front and center in the box set in a cardboard holder. Once you pull the phone and holder out, you will find the USB cable to charge the watch as well as an instruction pamphlet. It is minimal package but also decorative. The Mobvoi Ticwatch E watch face is 44mm x 13.55mm or 1.73 x .53 inches in old money. It weighs 41.5 grams or 1.46 ounces. It is powered by a MTK MT2601 Dual-core processor clocked at 1.2GHz and is coupled with 512GB of RAM and 4GB of Storage. The display is a Capacitive Multi-touch 1.4-inch OLED screen that renders at 400 x 400. This gives you approximately 287 dpi (Dots Per Inch). It is powered by a 300mAh battery. A couple of points to make regarding the display. First, it is an OLED screen so it produces excellent blacks and is far less power consuming than AMOLED displays that will find on the Apple Watch. That said, the AMOLED will product higher quality of colors overall. Second, the 287 dpi is outstanding is just a shade behind the Apple Watch which has a 303 dpi. The design of the Mobvoi Ticwatch E is simple and understated but doesn’t look like a toy at the same time. Being a teenager from the 1980s, it reminds be a bit of a Swatch Watch for those old enough to remember them. The chassis of the watch stands 13.5mm tall so it isn’t going to stick up a lot from your wrist. 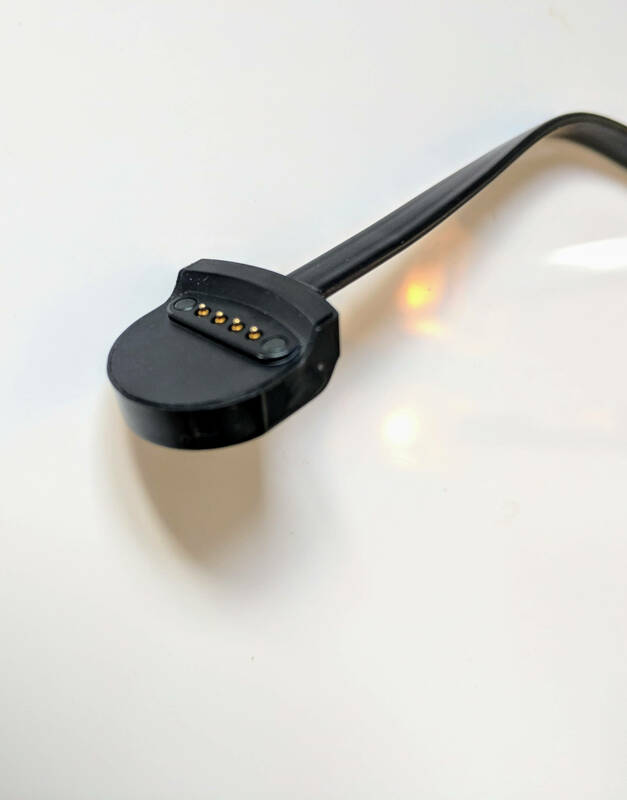 The strap connections are 20mm and are interchangable. Mobvoi sells several different bands on their site. In my case, I was sent the black (Shadow as they call it) which has a black silicone band. The band itself is stretch to a degree and very comfortable to wear. It is lightweight and doesn’t really feel like it is there when you are wearing the watch. I’ve been very impressed with the band quality and comfort. 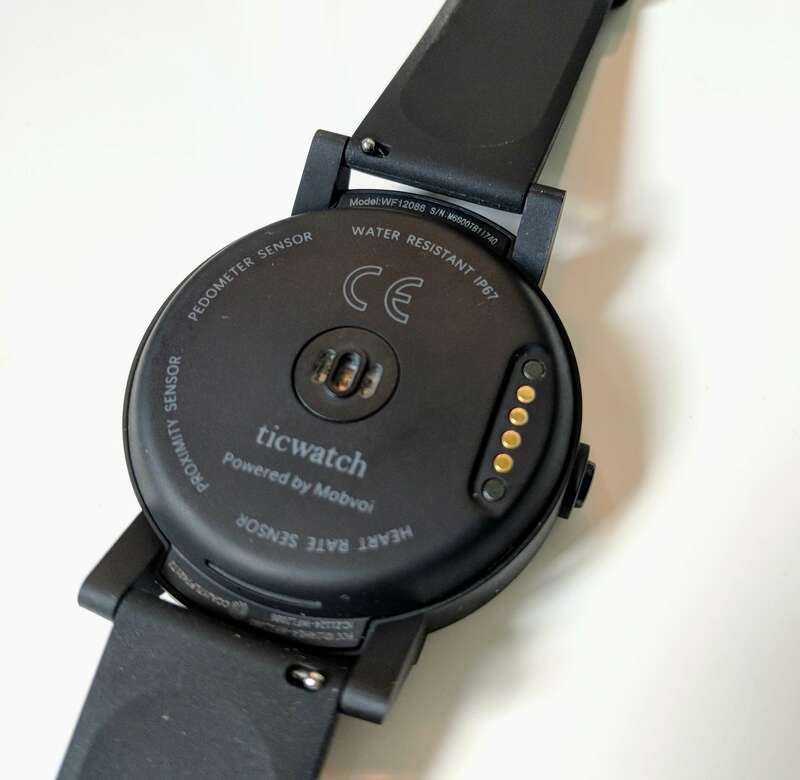 On the back of the watch is where you will find the heart rate monitor sensors as well as the four-pin connector to charge the watch. On the left side of the watch you will find the action button or crown if-you-will. Pressing it once turns on the watch face while pressing it a second time brings up all of the apps you have installed on the watch. Holding it for 2-3 second will bring up Google Assistant, a part of Android Wear 2.0. Design wise, the Mobvoi Ticwatch E is excellent. It isn’t heavy but, at the same time, doesn’t feel cheap. The silicone bands that ships with the watch is very comfortable and you won’t really notice it is on your wrist. When it comes to the overall performance of the Mobvoi Ticwatch E, it has been outstanding. The touchscreen display is responsive to touches and swipes without any lag or delays. On the subject of the screen, it is bright and easy to read. The only feature that hasn’t worked as well as I would like to see is the heart rate monitor. Even when wearing the watch tightly as I work out at the gym or I’m skiing, the monitor doesn’t accurately measure my heart rate. Wearing the Ticwatch E and my Fitbit Blaze, the Fitbit generally outperformed in this area. You have to decide if this is a show stopper for you. For me, I’m generally looking at any fitness wearable as “getting me in the ballpark” when it comes to step measurements and hear rate monitoring. That means this watch does the job for what I need it to do. If you are wanting more accuracy, this may not be the watch for you. With the watch running Android Wear 2.0, I have the option to install apps on the watch and they too have performed well. I have several different apps installed ranging from Google Play Music to the American Airlines app and none have had any issues with lag or lacking performance. In using the microphone and speaker, they also perform well, particularly the microphone. When I press and hold the crown button to activate Google Assistant, I find that it is nearly as accurate at hearing me as my phone is for the same commands. The speaker, as you would expect, is not very powerful and sounds “tinny” when playing music but, realistic, who’s going to do this? Finally, there have been complaints from some users about the lack of NFC support in the watch. This, again, may or may not be a deal breaker for you. For me, it isn’t as I’m use to paying with my phone using Android Pay and I don’t really care about the NFC not being there. You have to decide if it is a big deal for you. An area where the Ticwatch E shines is battery life. It is impressively good. I generally can do a day-and-a-half between charges performing normal activities. Those activities include notifications for apps, reminders and text messages, tracking my sleep with Sleep for Android and tracking my daily exercise and activities with Google Fit. This amount of life from the battery is far better than anything I’d ever achieved with any other Android Wear device and while it doesn’t last the 3-4 days I can get out of my Fitbit Blaze, it also does a lot more for me. While you need the Android Wear app to connect your Mobvoi Ticwatch E to your phone, you also have an optional app available, the Ticwatch app. Fundamentally the app is centered around the built-in fitness tracking of the watch and gives you an Appleesque circular display to show your steps and activities. You will get the same look on the watch itself if you use the built-in fitness apps. Beyond this, there isn’t much to do on the Ticwatch app itself. If you are going to use the built-in fitness features then it is a worthwhile download. If you plan on using Google Fit, like I do, you don’t need to download it. It’s good for what it is so I encourage readers to at least give it a go. 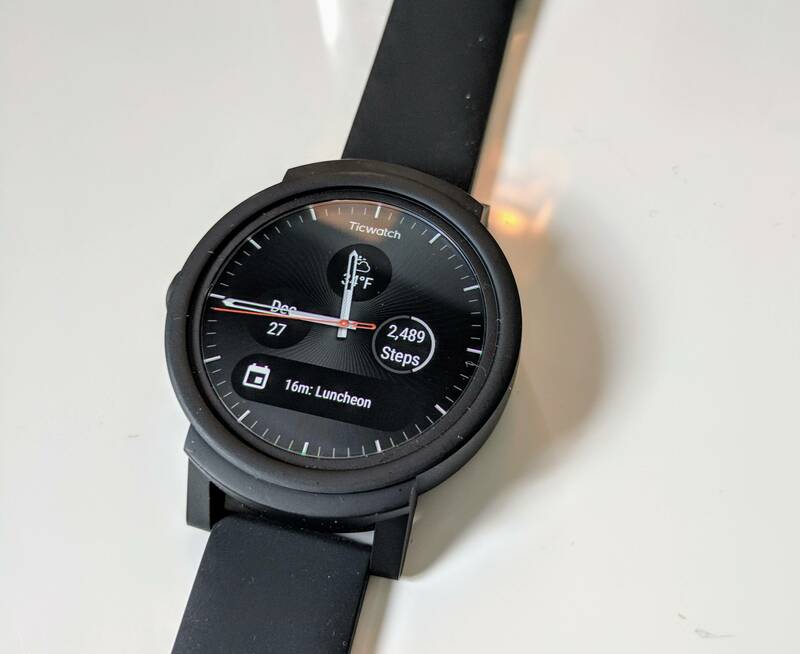 Without hesitation I recommend the Mobvoi Ticwatch E if you are looking for a solid performing Android Wear watch that won’t break the bank yet is current, powerful and well built. I’ve been wearing the watch nearly non-stop these past few weeks and I’m nothing short of impressed. My only drawback is the heart rate monitor but I’m not expecting deadly accuracy on that sensor on any watch. This, for me, isn’t a deal breaker nor is the lack of NFC. If those two are absolute requirements, this watch isn’t for you. If you want a long lasting watch that looks good and that is slated to get the Android Oreo update in early 2018, this is one to seriously consider. The Ticwatch E is currently $127 on Amazon.